I don’t know who to thank for contrasting sweet with savory and balancing the two in a single dish. I can’t even take credit for inventing candied bacon. I can, however, claim responsibility for the candied bacon I made last night. 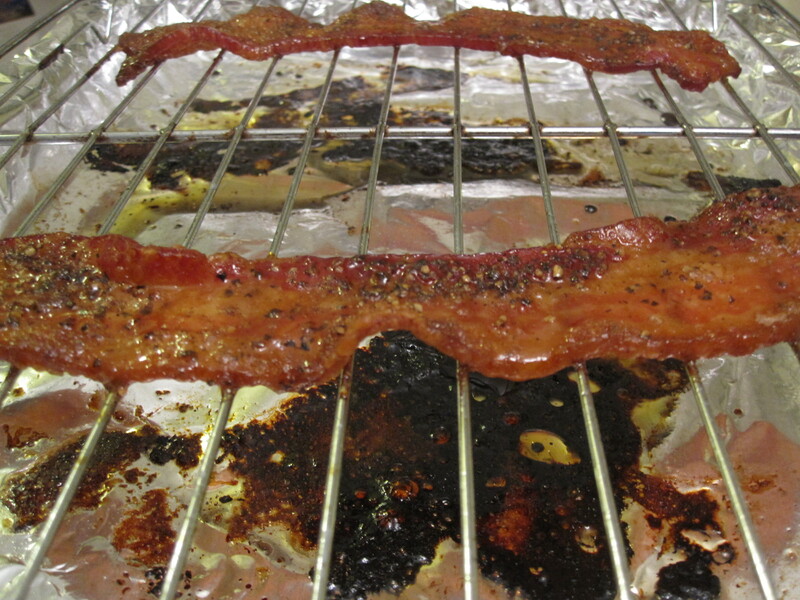 Lay bacon slices (I prefer thick-slice) on a cooling rack over a baking sheet. Sprinkle generously with brown sugar and freshly ground black pepper. Bake in a 425-degree Fahrenheit oven for 10-15 minutes, or until crispy. Jax, I love the popcorn idea! This got me thinking about where else to stick that candied bacon…a cake ball made of corn bread, maybe rolled in some maple frosting and topped with candied bacon. Eh?! This is absolutely genius. I mentioned your idea in the popcorn post.